You can't go wrong with the highly-rated OXO Good Grips Smooth Edge Can Opener! The side-wind mechanism cuts through cans easily and doesn't leave any sharp objects behind. It's constructed of high-quality stainless steel that's dishwasher safe for easy cleaning. Customers agree that this well-designed can opener is a great value. Like other OXO tools, this can opener is designed to be extremely comfortable—it has handles that lock together so you don’t need to squeeze them while you’re opening the can. The soft-grip knob is comfortably situated on the side of the can and it's super easy to turn. If the lid isn’t completely loose, the built-in lifting tool lets you remove it without getting your hands messy. If you're looking for a manual can opener that won't break the bank, this is a great option because it's reasonably priced and still does the job well. It earns extra points for ease of use and the slim design. There’s no need to squeeze the handles to grab the can, since the cutting mechanism latches on as you start turning, while the chrome loop helps you position the opener properly for can opening. Since this unseals the side of the lid, there are no sharp edges to worry about once the can is open. The heavy-duty chrome construction is supposed to be resistant to breaking, warping, scratching, staining, or tarnishing, although some customers said it broke after a year of use. For the most part, though, customers say they are happy with their purchase. If cost isn't an issue, this stainless steel can opener is the way to go. The high-quality stainless steel won't rust, tarnish, or fall apart over time, and it looks beautiful in any kitchen setting. Most importantly, the cutting mechanism is completely sealed and won't come in contact with food—which means that it seldom needs cleaning. Lateral cutting ensures no sharp edges that can mangle fingers, and the lid can be placed back on the can for short-term storage. The hanging hole on the handle also makes it easy to store on a rack where it’s easy to grab when you need it. Most reviewers agree that this manual opener is well worth the extra money and doesn't rust or tarnish over time. Having a magnet in your can opener will make it much easier to remove the lid without accidentally slicing your finger. We love this KitchenAid can opener because the magnet is strong and lifts lids without fail. Plus, the vibrant red color will add a bright pop of color to your kitchen. This product has a stainless steel cutter that pierces and cuts the top of the can, and then the magnet grabs the lid to keep it from falling into the can. This should be hand-washed and dried immediately to maintain the cutting edge. If you want a more versatile color for your kitchen, this model also comes in black and gray. Reviewers say that this can opener is heavier than expected, but the extra weight allows it to seamlessly open larger (and thicker) cans. This 3-in-1 can opener is ideal for people who have less dexterity on one hand, since you can safely operate the tool with the other hand. It can be used by either left or right-handed users, too! 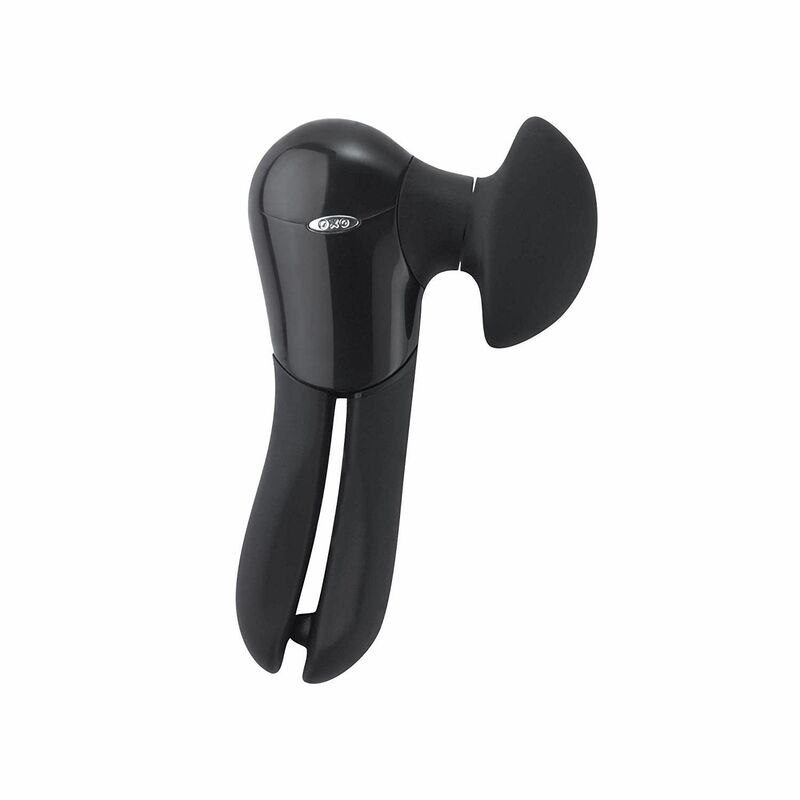 It features a no-squeeze single handle design and an easy-to-turn knob, so those with arthritis or joint pain won't have to worry about excessive gripping or squeezing. This operates from the side of the can, so it removes the lid without creating any sharp edges. Not a one-trick play, this gadget has an integrated bottle opener and a jar opener that will save you space in your kitchen. Folks who find that twisting a small knob is uncomfortable will love this can opener because it has a large crank handle. If you're worried about storing an item with such a large crank handle, it's able to fold down for more compact storage—it doesn't get more convenient than that. This traditional can opener works by piercing the top of the can and cuts neatly around the inside edge to completely remove the lid. When you’re done, it should be hand washed and dried immediately to preserve the cutting edge. The large size of this can opener makes it great for opening extra-large cans that smaller openers may struggle with. Reviewers say this is a comfortable can opener and many appreciate the versatility of this gadget. If you have children or teenagers who like to help out in the kitchen, you should invest in a can opener that opens cans from the side of the lid so you won't have any sharp edges. Our top pick is the Kuhn Rikon Auto Safety Master Can Opener. It's reasonably priced and has over 1,400 user reviews. With this can opener there’s no need to squeeze the handle, since the opener automatically grips the can as you begin twisting the top handle. If the lid seems a little stuck after it’s opened, mini pliers let you grip the edge of the lid for easy removal. Simply press a button on the side to release the lid into the recycling bin. This product also includes a bottle opener, a twist-off bottle opener, and a hook for easily grabbing pull tabs on cans. If you open a lot of cans in your household, this opener is the one you want. The large crank handle makes it easy to open can after can, and the heavy steel construction will last for years. It mounts to a wall, which saves you valuable drawer space and gives you easy access when cooking (mounting brackets and screws are included). The cutting wheel is made from high carbon steel that will stay sharp, which means you won't have to deal with dull blades that don't open. An integrated magnet grabs the lid when cutting is done so you won't cut your fingers grabbing it yourself. Since this unit remains attached to the wall, you’ll need to wipe clean any lingering food residue. Reviewers like that it folds back out of the way when not in use, and the built-in bottle opener is an added bonus. Our writers spent 5 hours researching the most popular manual can openers on the market. Before making their final recommendations, they considered 30 different can openers overall, screened options from 15 different brands and manufacturers, read over 20 user reviews (both positive and negative), and tested 5 of the can openers themselves. All of this research adds up to recommendations you can trust.